Alejandro Gutiérrez-Bolivar is the co-founder and CEO of Ladorian, a provider of digital POS advertising in Europe. Alejandro is a proud third-generation entrepreneur. He inherited the entrepreneurial gene from his father, who owned a civil engineering firm in Spain and was the son of a Cuban hat maker. Before becoming a founder, Alejandro began his professional career by learning POS marketing through his work with Banco Hispano Londres, JTI, and Pepsico over the course of 7 years. Though he valued his time with these big corporations, he constantly felt pulled to entrepreneurship. In 2002, after an Executive Development program at IESE Business School in Barcelona, Alejandro founded his first company, Unique Marketing, which delivered traditional POS marketing strategies for brands and retailers (printed signage and endcaps, for instance). During his experience with Unique, Alejandro witnessed the boom of digital advertising and the opportunity it presented for brick-and-mortar retailers. After 10 years of steady growth and traction in more traditional marketing strategy, Unique Marketing was hit by Spain’s economic crisis in 2012. Alejandro, seeing that the future of in-store advertising was digitally-enabled, knew that he could apply his team’s traditional marketing analytics to digital in-store ads. All the team needed was a platform to enable the data collection, and they could provide the intelligence for brands and retailers. 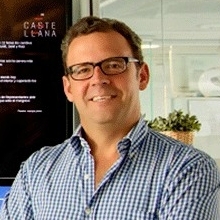 He re-directed the company’s resources into developing a software platform that would allow for smart analysis and algorithmic control of digital in-store advertising, and, in 2013, Ladorian came to life as a spin-off of Unique Marketing. With the proprietary software ready to deploy, Alejandro began convincing retailers that, by installing digital signage in-store, Ladorian could guarantee an increase in sales and, eventually, significant extra income for the retailer in the form of shared advertising revenue. In today’s digital world, however, companies are embracing the “phygital” trend in marketing, blurring the lines between physical and digital strategies. To help physical stores go digital, Ladorian leverages an all-in-one hardware and software solution that integrates in-store digital advertising with companies’ existing Enterprise Resource Planning (ERP) systems, allowing brands to achieve an average 30% sales increase. This system allows retailers to serve more targeted in-store ads on cutting-edge digital signage by considering a variety of factors like time of day and historical sales. As an all-in-one solution, Ladorian offers signage at wholesale prices, sets up a content management platform for the client, creates content and advertising for display, and sources external advertising from ad agencies. On top of all this, Ladorian delivers Googleverified analytics on the advertising metrics.